Who Are We? 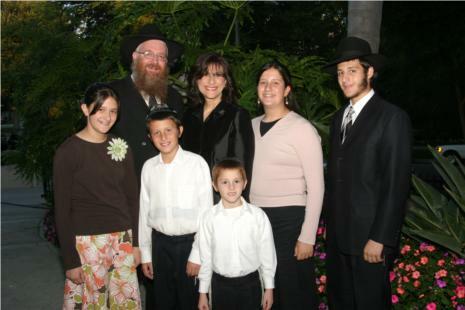 - Chabad of Bel Air - Where Everyone Feels At Home! We have heard great things about Rabbi Chaim Mentz and his friendly one on one warm approach. Many people in the Bel-Air and across adjacent Westside communities attend his synagogue and also send their children to him based upon his down-to-earth nurturing approach in teaching and guiding people towards Judiasm or just spirituality. So, this month, I decided to interview him as an integral member of the Bel-Air landscape. How and why did you become a rabbi? It was always so inherent in me to help people that I just gravitated towards it. Both of my parents grew up in non-observant [Jewish] homes, but they became religious before I was born. I found that my love of religion instilled in me by my parents enabled me to explain the mystique of Judaism to my non-observant relatives and soon many others were coming to me to learn. What do you hope to accomplish as a rabbi? Two things: to bring happiness to people's lives and to help them create a connection to their religion or spirituality. I make it an exciting, positive, non-judgmental experience. I am not a pulpit rabbi trying to sell a quick fix on how to become happy. I invite people to become part of my family and they begin to notice through my family that religion is a positive experience and a way of life. You say you're non-judgmental; can you give us an example of that? I have many people in my congregation who are intermarried, and it is quite amazing to see how they work as a team to bring more of this Jewish lifestyle to their home. I never make any Jew feel guilty that he/she married out of their faith. Why do you call yourself the "best kept secret in Bel-Air"? Being that we are in an exclusive neighborhood, people want to experience religion in a personal way without exposure to the rest of the world. I do not advertise because I prefer it to be a one-on-one, family-on-family experience. Have you received support or negativity from the community of Bel-Air? The people of Bel-Air have accepted us with open arms. So many families in the area who have attended other temples heard about our secret hideaway synagogue and have fallen in love with our style that they couldn't find elsewhere. Many Orthodox rabbis look so foreboding, so foreign with their long black coats, hats and flowing beards. Many people feel they can't relate. How do you combat that image? I smile; people love that instant acceptance. I do not like the word "orthodox." It sounds harsh, close-minded, right wing and very judgmental, and living in this cosmopolitan area people want to be accepted for who they are and not what you want them to be. Therefore, we have no membership fees, we don't ask for your religious background or affiliation. All we ask is that you come and enjoy and find out why Judaism has been so exciting for thousands of years. You welcome all. How do you sustain a synagogue? I don't believe in making people feel guilty that you have to pay to pray; I prefer the second choice of giving people a wonderful experience so they want to keep coming back with their families and others to enjoy. Thank G‑d people donate. When people come to your home for Shabbos [Friday night] dinners, are they surprised at their misconceptions of you and your family? At first yes, because most people think that my children are sheltered and could not associate with their children. But after ten minutes they recognize how normal and sociable my children are. In fact, my children are my best advertisement—they are proof that you could be "with it," happy, and well-adjusted with religion in your life. What if someone's not Jewish and wants to experience or even get spirituality and insight from you? Are you available to them? Besides being the rabbi of my synagogue, for many years I was a radio host on talk radio KFI AM 640 and had many non-Jewish listeners. For example, I meet people and we just sit and schmooze, and I let them know I am available to them just as much. I remind them that in this world we are all God's children and that I am here to open the door to your own spirituality no matter what. Today many people consider me not just a rabbi, but a close friend. Why have American Jews lost interest in their religion? I too would be bored with Judaism if I was put in a synagogue with a book to read which I didn't understand. How do you bring their interest back? My synagogue is based on their level, to uplift them to an understanding, love and appreciation of our awesome religion. Do you offer children's religious education? Yes, we have a private Sunday School. For Bar/Bat Mitzvahs this is all done one-on-one. Each boy and girl spends time with me and I become their best friend. Oftentimes when these kids grow up and go off to college, they end up e-mailing or calling me about their dilemmas because they always remember who is their best friend. Why did you love being on the radio, what did it do for you personally? Without using the Bible, I had to find a place within me to connect with people on all levels, regardless of religion. That made me become a better person because it gave me an opportunity to do my teaching in a whole new venue to speak on family values, morals and world politics. What would you like your next forum to be? I can't wait to get back on radio. In the meantime, I enjoy the appearances and opportunity to commentate on Fox News Cable and MSNBC. Who knows, I wouldn't mind having my own show on one of those networks; I had the top radio weekend show (4.5 rating) in LA and I know people want to hear what I have to say. I hear dinner at your home is fun, lively, and sometimes star-studded. Can you mention any names of stars who have been to your home? I respect people's privacy, so no names mentioned; but there have been celebrities in my home and synagogue. These people come from the industry and have not just come to experience the synagogue, but are looking for the one-on-one private person they can talk to outside of their inner-circle who keeps their secrets. Have you ever been offered a role in a movie as a rabbi from some of these showbiz people? Actually, some of these relationships have gotten me roles on TV. Tell me the role your wife, Charna, plays in your lives. Besides being the best wife in the world, she is a mentor to many of the women in the community. She is also a teacher in school and the mother of our five children—ages ranging from eight to sixteen. She loves showing people the life we have created that they too can have. I hear she is an amazing cook. You hear right. Come have dinner with us any Shabbos after services. It is a feast you will remember. Some members of the congregation walk to my home after service, and the table is ready with smiles and love and the food tastes even more special because it is Shabbos.